I use Google so much; I have it set as my home page. Everything I do on the Net revolves around Google in one way or another and if the company is worth $150 billion, this is an example of why. First off, I'd like to say that having grown up in the 2nd half of the 20th century well before the advent of this thing called the Internet; I remain positively flabbergasted by it. It's amazing. However, I have come to appreciate Google's contribution to my amazement because having access to a whole lot of information without any organization is daunting. I don't think of this all the time, but once in a while I reflect at how I can type in a search in Google and within the blink of an eye, I have a series of links connecting me to sources of data all over the world. Wow and double wow. How the heck did I or anybody else grow up without the Internet and contend with looking for information in libraries? Google search: "william quincy belle"
I get back 28,000 results. The difference is very, very important as you can see by the number of results. In the first example, the ten million plus results show results which have william and quincy and belle. The three words can be anywhere on the web page. In the second example, the quotation marks mean we are looking for the phrase william quincy belle. That is, the three words have to come one after another just as they appear in the quotes. So that's why there are 10 million pages with william and quincy and belle but only 28,000 with the phrase "william quincy belle". FYI: searches are not case sensitive. You can type in uppercase or lowercase; they are both treated as equal. I have written a couple of articles where I have made reference to one Molly Monet of Postcards from a Peaceful Divorce. Google search: "william quincy belle" "molly monet"
The above search looks for two expressions. Because I enclosed the words in quotation marks, I am asking for the phrase; the words must be in that order. The results must have both expressions but each expression can be anywhere on the page. Google search: "william quincy belle" "molly monet" "annie parker" "pauline gaines"
I wrote an article entitled "The War of the Divorcées" and as you can see, this article contains all four expressions. You will also note that I reposted the article on zimbio.com, open.salon.com and oddly enough it appears on some site called improveyourmemorystore.com. They didn't ask me to reprint this but I have discovered a number of sites which troll around the Net automatically grabbing content. Oh well. This fantastic little parameter allows you to refine your search and zero in on what you may be looking for. Normally when you type in a search, you're searching the entire Internet which by the way is estimated at over 25 billion pages. Whew, that's a lot of pages. How does this work? Let's look at some examples. I get back 16 results but 16 results of what? As you may have already guessed, I am looking for the expression "molly monet" but the site parameter let's me narrow my search to one web site, here my own blog. Now I get back 2 results. The above gave me 3 results. WARNING! I am typing these search queries in around 6:30pm EDT (Eastern Daylight Time) on July 4, 2011. Keep in mind that things change so if you try these very same search queries you may get different results. How you know what to type in after the parameter "site:"? Google seems to be flexible. I can type in "http://wqebelle.blogspot.com" or "wqebelle.blogspot.com"; either works just fine. I get back one link which is to the article "How Divorce Lost Its Groove" by Pamela Paul, June 17, 2011. The above search finds my name but it is also going to find my name on my own blog. What if I'm looking for references elsewhere? I know it's going to be on my blog but what if I'm trying to find out if anybody else is using it? Instead of 28,000 results, I now get 26,900 results. Why? The "minus site" parameter tells Google to look everywhere but on my blog. However, as I go down the list I see references in Twitter, in Facebook, in Open Salon and Zimbio. Okay, I know my name is going to turn up there because I put it there by crossposting my blog. Ah, now I see 22,000 results. I am now a lot closer to getting links of web pages containing the expression which are not part of my blog or my repostings. As I previously said, I have found a number of sites that automatically reprint stuff, well, blogs, so I have found some of my articles showing up in places I did not know even existed. If you do the same, don't be surprised to find your words republished someplace. If you put it on the Internet, sooner or later somebody's going to find it. 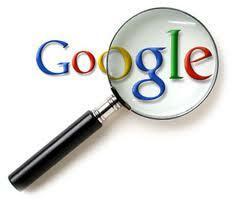 Google allows you to search on anything and everything. With such a vast repository of information to tap into, the problem in finding anything is refining your search so you can whittle things down to the essential. As I said, we're starting with over 24 billion web pages. I am going to get back pages that contain the word john and the word doe but not necessarily together. Google supports wildcards and various operators which allow you to search on variations of words while using AND or OR or NOT to join snippets of searches together. Now we're getting complicated but it is possible to really, really refine your searches so you can narrow down those 24 billion web pages to something more manageable. Here are a few extras you may not know about. I get back: entries which define the word "blog". Note, Google also has a build-in spell checker so if you make a mistake, it will ask you if you want to redo the search with an alternative spelling or word. I get back: What? The weather for Tokyo? Hel-lo!!! Yes, Google is my home page. One click to my mail, one click to the news, or I'm ready to type in keywords to search for stuff. Add on top of that my bookmarks in the browser and I've got everything at my fingertips. I'm all set to search the Internet in my quest to discover what's wrong with the world. In addition to providing easy access to billions of web pages, Google has many special features to help you to find exactly what you’re looking for.